A simple, delicate, showstopper. They can be any flavour and colour combination you like. You can dip the bottoms in melted chocolate or decorate them with sprinkles before baking. Easy to make these melt in your mouth cookies are a favourite of many. I piped these with a piping bag and notched tip but you can use any type of ziplock bag with the corner cut off or even just a tablespoon to spoon the meringue out. They look great free formed and hold whatever shape you make them. I do recommend baking them on parchment paper or silpat mats. It is a fantastic addition to your cookie collection. Place egg whites in a mixing bowl. 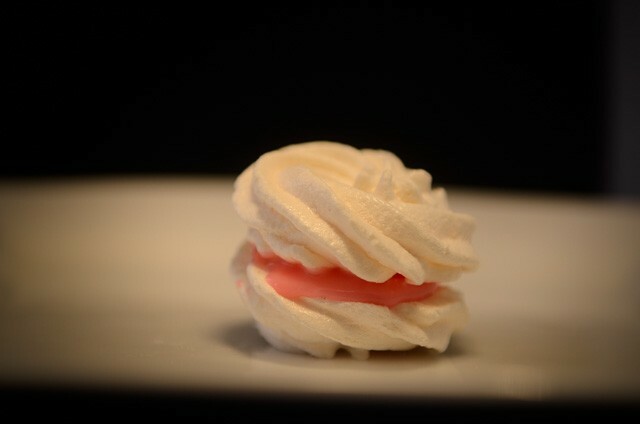 Add almond flavouring, colouring (if using), cream of tartar and salt to egg whites; beat on medium speed until foamy. Gradually add sugar, 1 tablespoon at a time, beating on high after each addition until sugar is dissolved. Continue beating until stiff glossy peaks form. Cut a small hole in the tip of a pastry bag or in a corner of a food-safe plastic bag; insert a star tip. Transfer meringue to bag. Pipe cookies 2 in. apart onto parchment paper-lined baking sheets. Bake 40-45 minutes at 250 degrees until firm to the touch. Turn off oven leave meringues in oven 1 hour. Remove from oven; cool completely on baking sheets. 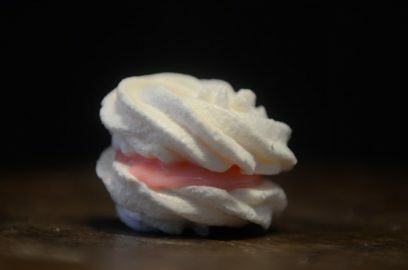 Remove meringues from paper; store in an airtight container at room temperature. I like to double up my cookie sheets to insulate the bottoms of the meringues from getting to dark, especially when making white meringue cookies. You can serve them just as they are or dress them up with filling. I decided to sandwich these with a luscious ruby red grapefruit curd.